I feel crummy tonight. I felt crummy most of the day, and most of yesterday. I’ve no idea why, and I know it’ll pass, but in the meantime, it’s sapped me of all my energy and joie de vivre. All I long for at the moment is to sleep in peace. Maybe when I get to dreamland, I’ll reunite with my inner tiger and regain my zing. I wish you a good night. Oh, and me, too, please. This entry was posted in Animals, Art and tagged art, digital illustration, I plan to feel better tomorrow., tiger by kathryningrid. Bookmark the permalink. 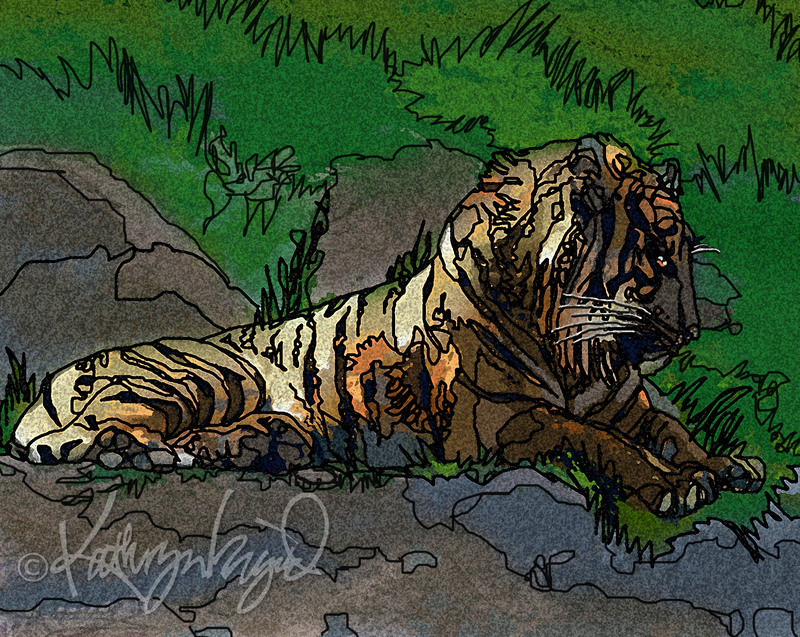 Your Tiger is a good looker, pleasant dreams. Thank you, I’ve had quite the time reviving him from his somnolent state. But now that the various doctoring crews have uncovered and begun to deal with the kidney-stone-related whys and wherefores of his coma, I’m happy to sense that El Tigre will awaken again sooner rather than later! Exactly. I’m delighted that yesterday’s laser-like surgery went so smoothly and with every gallon of fluid slurped I’m evicting more of the sandy evidence. Feels good to be on the side of solution (no pun intended) now instead of unknown-problem. Soon enough, the purring will begin again. *Now* I have. Happy to be diagnosed and on the mend (see notes above! ), and I fully expect to feel worlds better and ready to take a big-cat stretch and move on by the beginning of the week. The “good” night turned out to be exactly that, despite feeling like it was a rotten one—since it led to hospitalization, diagnosis, and treatment that’s already beginning to head me toward many more good nights’ sleep ahead! And tigerish energy for the days!! Better yet, I’m being taken care *of* by so many! 🙂 Thanks for the kind wishes. I now know that you understand this better than most!! I can already hear faint stirrings of the purr-motor feeling more satisfied and ready to rumble. Couple more days of, ahem, flushing out the culprit and I should be out hunting for new adventures again. It’s not *just* my name that makes me feel such an affinity with Kats, I mean cats—I understand their desire/need for masses of deep sleep, too! 😉 All of the medical attention in the last few days is paying off, and as soon as I’m fully cleared of the kidney stone’s last dust I can tell I’m going to be on the prowl for fun again. Thank you, Auntie, all of the hugs are the best healing therapy of all! Hope you’re feeling well these days, too. I’ve been so incredibly lucky to have far less agony throughout this process than many I know, so along with just plain physically feeling the recovery is in action, I’m full of gratitude and optimism. All good medicine indeed.